The Commitment to Comfort Pain Initiative was created to promote comfort by helping to lessen pain and anxiety in children and their families. In March 2017, the Child Life team and the Pain Service team at ACH officially rolled-out a site-wide Commitment to Comfort Pain Initiative. What began a year and a half ago in the Emergency Department as a way to improve kids (and parents) comfort with pain is now spreading across the hospital. To help a child be more comfortable when they’re in pain or anticipating pain (like a needle poke) is both a short term and long-term objective, comments Cathy Smith, Certified Child Life Specialist. Since 2015, a multi-disciplinary Pain Committee has been established and they meet once a month on how best to implement new strategies to help children and their families cope with pain. This work has evolved to include the use comfort kits, regular use of numbing cream, and MEDi, the robot that distracts kids and high fives them when getting a needle. 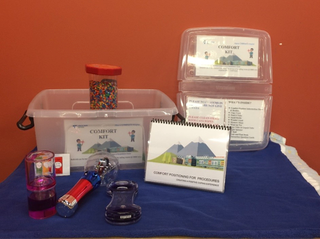 Comfort kits can be found in each of the hospital’s four inpatient units, PICU, PACU, and the HOT (Hematology/Oncology/Transplant) Clinic. Inside a comfort kit are distraction toys, a how-to guide for comfort positions for families to comfort their child during procedures, comfort care plans, and other helpful items. The ultimate goal of the Initiative is for children to be able to identify what would help them be comforted when they undergo a procedure (such as sutures, needle pokes, MRI’s, etc.) and that they can ask for these comfort items from their healthcare team. 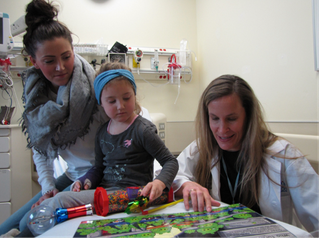 By doing this, child patients and their families are creating their Comfort Care Plan and gaining some control over what’s happening to them. Our aim is to set kids and their families up for success. Each success builds confidence, decreases stress and anxiety over procedures and creates more trust in the healthcare team, comments Sandy Baggott, Child Life Team Leader. Sometimes it takes more time to get ready for a procedure when considering a patient’s Comfort Care Plan but the outcome is usually better. Smith also shared that they recently did a consult with PFCC’s Family Advisory Council about launching a Caregiver Guide for the Commitment to Comfort Pain Initiative. Still in its draft phase, this Guide is an exciting segue to the future when the Initiative moves into ACH’s outpatient clinics. It will help caregivers support their children both in the hospital and at home with managing their pain. The Commitment to Comfort Pain Initiative rollout was staggered over two-weeks in March to accommodate shift rotations. We really wanted all staff to be educated and exposed to what the Commitment to Comfort Pain Initiative is all about and how they can take an active role in bettering the lives of their patients, says Smith. Tri-fold displays rotated each day through Units 1 to 4, PICU, PACU, and the HOT Clinic and each tri-fold described a different component of the Initiative. Displays included information on comfort positions for a child and parent, importance of addressing pain, how to create a Comfort Care Plan, appropriate language, and more. As with any type of rollout, creating buy-in at the front line is paramount. 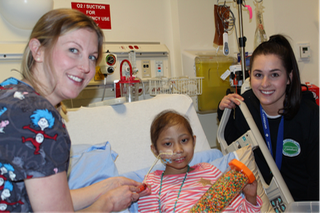 By educating the nursing staff at all levels (seasoned nurses, nurses in training and student nurses), physicians and allied health professionals, Child Life is hopeful that this Commitment to Comfort becomes a regular occurrence on the units. We are changing a culture for many; healthcare staff and families. But we all share the same objective and that’s to provide the best care that we can for our child patients, states Smith. We’ve already had positive involvement and we are hopeful to keep it going on all the units.